A recent Levi Dalton interview with Bedrock Winery’s owner and winemaker Morgan Twain-Peterson inspired me to write about CA Syrah priced at around $25. Morgan said in the interview (a fascinating listen) that he felt that it’s hard to find true CA Syrah with all it’s savory, peppery, and lifted quality at the $25 price point, and that’s keeping Syrah back in CA. People aren’t able to sort of play around in the category of California Syrah without having to fork over $40 or $50. I think that most of what Morgan says is true, it is difficult to find them but they’re out there. I’m going to help you find them. Here’s my list of twelve “around $25” bottles of California Syrah with true Syrah characteristics. First a disclaimer of sorts: I do a lot of shopping at K and L Wine Merchants here in the Bay Area. Most of these wines are available there. Let it be known though that I am not a paid shill for K and L. We all have our favorite wine stores, I’m lucky enough to have K and L near my home so I can order from there and pick the wine up to avoid shipping cost. It’s as simple as that. Spicerack Syrah ($19) : This was one of the first CA Syrahs that I found that really piqued my interest in cool-climate Syrah. It has a freshness and crunchiness that I just wasn’t finding in other CA Syrah. Judicious use of oak also helps the fruit shine through. Andrew Murray Tous Les Jours Santa Ynez Valley ($13): Andrew Murray makes good wine, usually it’s a little on the ripe side but it’s well made. I have to admit this is a pretty obvious choice but I wanted to include it because it usually has some interesting meaty Syrah character that’s difficult to find in other wines at this price point. Fields Family Estate Syrah ($24) : Ryan Sherman is quickly making a name for himself with his fresh and savory Lodi wines. His Syrah is one of my favorite wines and although it’s not exactly a Northern Rhone it has an earthy, peppery side that you just don’t normally find in Lodi. Piedrasassi “P.S.” Central Coast Syrah ($19): Piedrasassi makes a less-expensive Syrah that has a lot of true Syrah character and a deliciousness factor that’s hard to beat. It also comes in like the coolest little bottle on the planet. Terre Rouge Les Cotes de l’Ouest ($18): Bill Easton is known for his age-able old vine Syrahs from various soils and elevations in Amador County. But he also makes a widely available St. Joseph style Syrah meant for daily consumption. It sees less oak and it’s elegant and floral and has a pure, peppery aroma that Syrah should have. And from mostly Lodi fruit! Bonny Doon Vineyard ‘Le Pousseur’ Syrah ($24): It’s the earthy, meaty, side of this wine that makes it such a treat. Randall Graham is a Syrah genius and this least expensive example is a winner. Tolosa Estate Syrah ($24): Now, to be honest, I’ve only had the 2010 and 2011 which were the coolest vintages California had seen for years, so I can’t vouch for the ’12 as being a wine with Syrah personality but the ’10 and ’11 had it in spades. Copain “Tous Ensemble” Mendocino County Syrah ($20): This Syrah’s always a winner. It has the elegance of Copain’s higher end bottlings but not the price. It has a core of minerality that you generally don’t see at this price point and a fresh fruit character. Qupe Central Coast Syrah ($18): Like the Andrew Murray wine, I drank a lot of this when I was getting into Syrah. It’s always good, the 2011 was the best vintage I’d had in a while, a restrained and floral version of Syrah. Regardless of the vintage though, this is pure, delicious Syrah. Anthill Peters Ranch Syrah ($27): Every time I have the Anthill Syrahs I pinch myself that they’re still in the $25 range. These are the best and most authentically Northern Rhone style Syrahs that you can get for this price. Anthill Campbell Ranch Syrah ($27): The Campbell is a tad richer and fuller than the Peters but equally delicious. It has a memorable umami character that makes it a must taste. Bedrock North Coast Syrah ($29): Well, I had to include Morgan’s own wine because it’s really, really good. It’s a blend from various Syrah vineyards up and down the Coast depending on the vintage but the wine always over delivers for the price. Morgan treats the fruit in a way that gives it a true Syrah character. It’s rich but peppery and with good acidity too. So there’s my list. Please feel free comment on ones I may have missed and here’s hoping the future brings a commitment from other talented winemakers to true Syrah that doesn’t break the bank. If Syrah in California is to make the comeback that some say it’s making, Morgan’s right, we’ll need more Syrahs that get new wine lovers excited about the savory, meaty side of Syrah, without having to shell out the big bucks. There’s great potential in New Zealand for Syrah with cool-climate character and I’ve had some great examples. I’ve had others that have been treated with too much new oak in the cellar and the results have been less than impressive. But the honest Syrahs that I’ve had have been transcendent and all for a really good price. 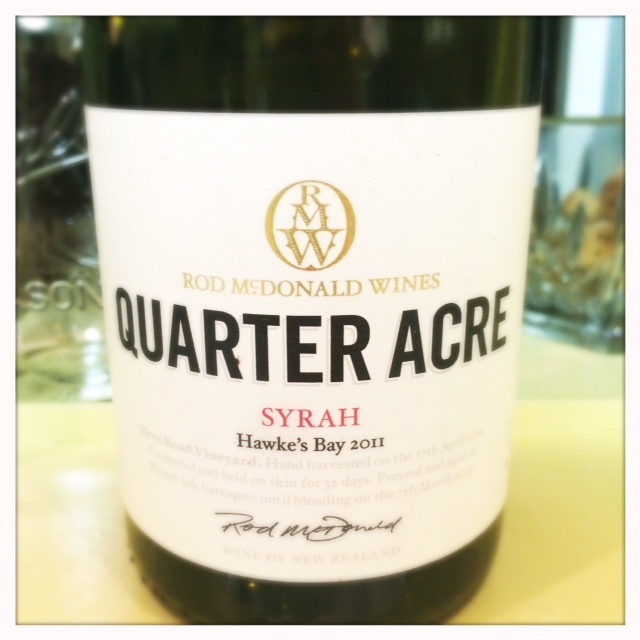 The Quarter Acre has a candied fresh red fruit and plum nose that transfers over to a smooth and full mid-palate. There’s some savory here in the form of aromas of black olive and tobacco but this is not a northern Rhone style Syrah. What it is is a pure, fresh, new world Syrah with good acidity and honesty. This is a delicious wine and pulls way more than its $20 weight. That’s my impression with the Quarter Acre; it’s a wine that has some funk and soul but also it’s just plain delicious to drink. These are wines that I can’t get out of my head, they are all different in style but what unites them is that they’re memorable and well made for the style that they embrace. Here are the top five Syrahs that I drank in 2014. Follow the links for the tasting notes from the original post. The 2008 Barruol Cote Rotie: This is a Kermit Lynch selection from Louis Barruol’s St. Cosme label that really knocked my socks off, beautifully floral and elegant, just as a Cote Rotie should be. A great way to start off 2014 and a reminder to figure out a way to drink more Cote Rotie. The 2009 Bonny Doon Bien Nacido X-block: Yes, there is something special about Bien Nacido, especially when the grapes are picked at modest ripeness and the wines are vinified in a way that lets the fruit shine. This is one of those wines. Elegance, intensity and fascinating floral aromas mixed with a black olive and pepper character. The 2001 Copain Eaglepoint Syrah: This wine was a fun find for me. I liked Eaglepoint Syrah from an early stage in my Syrah-drinking career and I’ve wondered here before why there aren’t more wines made from Eaglepoint Syrah. This wine confirmed my belief that Syrah from Eaglepoint Vineyard can be delicious but I’ve yet to learn the full story behind its lack of visibility in today’s marketplace. The 2012 Nellessen Wind Gap: If you want to experience a California Syrah that has its roots in France, this is a great one to try. The Nellessen is all black olive and pepper, bright plum and intense acidity. It’s a dead ringer for a Northern Rhone savory Syrah. The 2010 Piedrasassi Rim Rock Syrah: This Syrah tops my list. It’s a beauty, meaty, rich, savory with lots of structure that makes it built for the cellar. It’s fun to drink now though, especially after a decant or some time open when the wine rounds out and really sings. There’s one more wine from 2014 that I would be remiss to not mention. I had the pleasure of meeting up with some fellow Syrah geeks and one of the dinner participants brought a 2000 Thierry Allemand Cornas Chaillot. It was one of the best Syrahs I’ve ever had. I didn’t take notes but simply enjoyed the wine with the fabulous food at the Palace Restaurant in the Mission District of San Francisco. It matched well with everything, even a delicate prawn dish. I’m not including it in my top five because I didn’t record it here on the blog but it should be in the list and it was a privilege to try. My Syrah resolutions for 2015 are to drink more Northern Rhone Syrah, I’m still a novice when it comes to this region and I probably will be until I actually get a chance to visit the region but in the meantime I’ll keep drinking, learning, and writing it all down on this little blog. Thanks so much for reading.